Huabcharoen, P., Wimolmala, E., Markpin, T., and Sombatsompop, N. (2017). "Purification and characterization of silica from sugarcane bagasse ash as a reinforcing filler in natural rubber composites," BioRes. 12(1), 1228-1245. This work studied the chemical composition, cure characteristics, and morphological and mechanical properties of natural rubber (NR) compounds filled with silica, which was derived from bagasse ash (BA). The BA filler underwent various preparation processes (untreated, hydrochloric acid (HCl)-treated, and HCl/ammonium fluoride (HCl/NH4F) extracted). The results revealed that the main functional group of the BA was silica. After purification by HCl and HCl/NH4F, the silica content increased from 77.2% to 90.6% and 97.0%, respectively. Longer cure times and lower crosslinking were obtained after purifying the silica. Treatment of silica with HCl/NH4F improved the tensile strength and compression set when added at 15 parts per hundred rubber (phr) loading. Purification with HCl and HCl/NH4F acted as an obstacle to rubber-rubber crosslinking, but helped to moderate the filler–filler interaction. The elongation range for the NR containing the BA silica in this work was 900% to 1,100%. The use of HCl/NH4F-extracted silica in NR vulcanizates had no effect on the lightness, while the untreated and HCl-treated silica displayed decreased lightness. The silica from BA is recommended for use as reinforcing filler in NR compounds if treated with HCl followed by NH4F extraction before use. The optimal loading of the treated silica was 15 phr. Sugar cane is commonly burned as fuel in electricity production. Bagasse is the fibrous residue remaining after sugar cane stalks have been crushed to extract their juice. A large amount of space is needed to dump the bagasse ash (BA) waste (Frias et al. 2011; Pereira et al. 2011). Current research indicates that BA can be used as a soil stabilizer in agriculture (Kharade et al. 2014), pozzolanic material in concrete production (Abdel-Kader and Darweesh 2010; Bahurudeen and Santhanam 2015), recycled raw material in clay production (Faria et al. 2012), for sound absorption, and for the adsorption of dyes. Silica can be extracted from BA, which can then be used as a filler reinforcement in natural rubber compounds (Noonpui et al. 2010; Phrommedetch and Pattamaprom 2010; Kanking et al. 2012; Rahman et al. 2015). Silica from BA is potentially a good replacement for commercial silica, as it has increased cost-effectiveness and reduces waste. Natural rubber (NR) is a material with many desirable characteristics, such as high flexibility and strength, resistance to tearing and abrasion, and good dynamic properties if it is properly reinforced. However, the properties of NR compounds can worsen under conditions of extremely high mechanical loads, or excessively high or low temperatures during service. Therefore, the rubber needs to be reinforced with proper fillers, such as carbon black and silica fillers (Thomas et al. 2014). Filler reinforcements in NR can be divided into two categories: reinforcement with a black material, such as carbon black, and reinforcement with a non-black (or colored) material, such as silica, calcium carbonate, and calcined kaolin (Wolff 1996; Kohjiya and Ikeda 2014). For colored rubber products, silica is the reinforcing filler that is used most often. At present, silica can be obtained from various natural resources, such as BA and other agricultural wastes (Kanking et al. 2012). Previous research (Batra et al. 2008; Kumar et al. 2014) indicates that BA has an average particle size of less than 150 µm, with an asymmetrical shape and porous surface, and contains silica as the main element, which makes up more than 75.4% of its weight. The other elements contained in BA are metal oxides. The authors’ previous work (Kanking et al. 2012) suggested that adding untreated silica-based BA to NR compounds at a maximum silica content of 15 parts per hundred rubber (phr) did not affect the scorch time and cure time, but did affect the mechanical properties, especially the values of the tensile modulus, tensile strength, and hardness, as well as the compression set. A production process that purifies silica from BA involves adding a sodium hydroxide solution to create sodium silicate, and then polyethylene glycol is used to extract silica through the sol-gel process, while the quality of the silica is controlled by the pH method. This procedure was found to yield a silica product having a spongy surface with a pH of 3 (Rahman et al. 2015). When BA was immersed in hydrochloric acid (HCl), the silica was purified to 89%, as a result of metal oxide burning by HCl. The uncleanliness of ash is primarily a result of its spongy nature (Kalapathy et al. 2000; Worathanakul et al. 2009). Another study (Ma et al. 2012) was carried out using ammonium fluoride (NH4F) to purify silica in BA. It was found that the silica dissolved well in the NH4F solvent and that this process could purify the silica, which resulted in 95% silica content. Based on the previous literature, the purification process for producing silica from BA for NR compounds is not widely agreed upon and is still open for discussion among rubber scientists and technologists. Currently, there has been no research that has compared the different processes of purifying silica from BA. Therefore, this work was aimed at exploring an efficient process for purifying and obtaining silica from BA. Based on the previous works by Kalapathy et al. (2000), Worathanakul et al. (2009), and Ma et al. 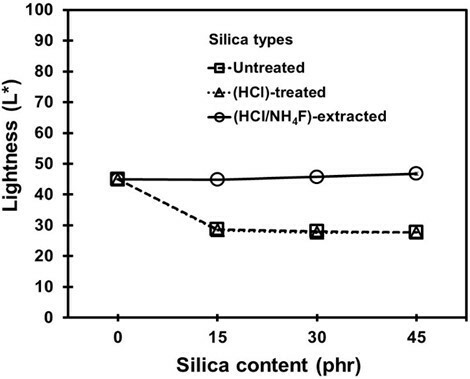 (2012), treatments by HCl and NH4F gave high yields of silica. Therefore, the silica purifying processes explored in this work included a single-step soaking with HCl and a two-step soaking with HCl before extraction in NH4F. The purified silica was then used as filler in NR. Cure characteristics, mechanical properties, and physical properties were investigated, and the results were compared with the NR filled with untreated silica filler. Natural rubber (NR; grade STR 20) and vulcanizing chemicals, including zinc oxide (ZnO), stearic acid, mercaptobenzothiazole (MBT), diphenylguanidine (DPG), sulfur, and N-(1,3-dimethylbutyl)-N′-phenyl-p-phenylenediamine (6PPD; an antioxidant), were mixed to produce the NR compounds. The vulcanizing formulations, including the quantities of all of the chemicals and their suppliers, for creating the NR compounds are given in Table 1. Polyethylene glycol (PEG) was used as a dispersing agent for the silica-filled rubber compounds. BA, supplied by the Dan Chang Bio-Power station of Mitr Phol Sugar Corp., Ltd. (Suphanburi, Thailand), was used as the main source for producing silica. Three different forms of the silica-based BA were used, including untreated silica BA, HCl-treated silica BA, and NH4F-extracted and HCl-treated silica BA. The acid-treated BA (weighing 100 g and supplemented with 1 M HCl) was supplied by Siam Beta Group Co., Ltd. (Bangkok, Thailand). After thoroughly stirring at 100 °C for 2 h, the solution was filtered. The remaining portion of the BA was then neutralized by washing it with deionized water (pH 7), which was followed by drying in a vacuum oven at 120 °C for 12 h until a constant weight was achieved. The BA underwent HCl treatment, as described above, before being extracted in 1.125 mL of 4 M NH4F solution, supplied by Merck (Bangkok, Thailand). The solution was stirred continuously at 120 °C for 3 h to purify the silica before filtering the ingredients. The filtrate was then supplemented with 100 mL of ammonium hydroxide (NH4OH) and stirred continuously at 60 to 90 °C until a thick solution (slurry) was obtained. The slurry substance was then thermally aged at 60 °C for 3 h before filtration. The remaining portion of the BA was neutralized by washing it with deionized water (pH 7), and it was then left in an oven at 120 °C for 12 h to eliminate moisture. The extraction process of the acid-treated BA is shown in Fig. 1. 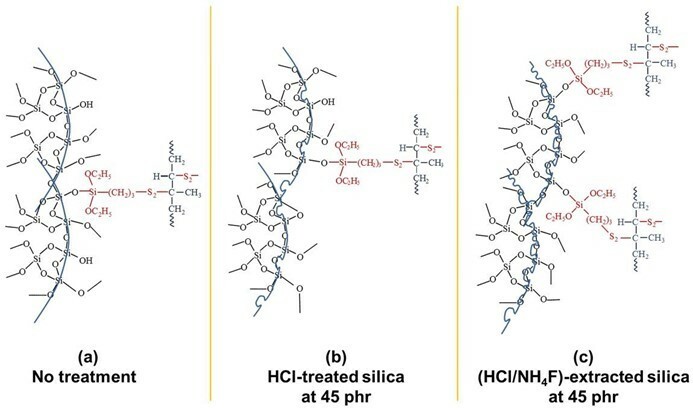 After the HCl and NH4F treatments, the BA was chemically treated to improve the surface adhesion of the silica-based BA and the rubber using a silane coupling agent with the chemical structure of (C2H5O)3-Si-(CH2)3-S4-(CH2)3-Si-(C2H5O)3, which is known as Couplink 89 and was supplied by Behn Meyer Chemicals Co., Ltd. (Bangkok, Thailand). The experimental procedure for the silane treatment is given in the authors’ previous work (Kanking et al. 2012). The morphology of the BA fillers was analyzed using a scanning electron microscope (SEM) (model JSM-6610LV, JEOL, Tokyo, Japan), with a voltage of 10 kV and current of 15 A. The chemical functional groups of the BA fillers were examined using Fourier transform infrared spectroscopy (FTIR) (Nicolet™ iS5, Thermo Fisher Scientific, Waltham, MA), and the chemical composition was investigated using X-ray fluorescence spectrometry (XRF) (S8 TIGER, Bruker, Billerica, MA). An X-ray diffractometer (XRD) (D8 Discover; Bruker) was employed to reveal the crystallization behavior of the BA. The distribution and range of the BA particle sizes were studied using a laser diffraction particle size analyzer (LS 13 320, Beckman Coulter, Brea, CA). The surface characteristics, such as specific surface area, pore volume, and pore size, of the BA were investigated using a specific surface area analyzer (Autosorb-1, Quantachrome Instruments, Boynton Beach, FL), based on the Brunauer-Emmett-Teller method. The functional groups of the silica in the BA filler before and after the HCl and HCl/NH4F treatments were characterized by FTIR. The characterization results for the untreated and treated BA, which will be discussed in detail in the Results and Discussion section, are given in Table 2. The compounding process was initiated by masticating the NR in a laboratory two-roll mill (Yong Fong Machinery Co., Ltd., Samut Sakhon, Thailand) for 5 min. The masticated NR was then compounded with the prepared chemicals and fillers, as given in Table 1. The silica content in the BA fillers was varied at 0, 15, 30, and 45 phr. The addition of the BA filler was also carried out in the two-roll mill for 30 min to ensure a uniform distribution of the filler. The resulting NR compounds were kept at 25 °C and 50% humidity prior to use. The NR compounds were then compression molded to a 90% cure using a hot press (LabTech Engineering Co., Ltd., Bangkok, Thailand) at 150 kg/cm2 and a temperature of 160 °C to produce the NR vulcanizates for further testing. The scorch time, cure time, and torque differences were evaluated using an oscillating die rheometer (GT 7070-S2, GOTECH Testing Machines, Taichung City, Taiwan) at a temperature of 160 °C, and following the procedures of the ASTM D2084-11 (2012) standard test method. The specified cure time was used for vulcanizing the individual NR compounds in a hydraulic press. The tensile properties of the NR vulcanizates, i.e. the tensile modulus at 100% elongation, tensile strength, and elongation at break, were studied using a universal testing machine (Autograph AG-I, Shimadzu, Tokyo, Japan) at 5 kN, according to the ASTM D412-15a (2016) standard test method. The tensile testing speed used for all of the specimens was 500 mm/min. The hardness of all of the NR vulcanizates was tested under the test conditions given by ASTM D2240-05 (2005), using a durometer (Shore A) (Model GS-719G, Teclock, Okaya, Japan). The compression set was assessed at a temperature of 100 °C after 22 h, in accordance with ASTM D395-03 (2003) method B. The crosslink density method was used to determine the swelling behavior of the rubber vulcanizates by preparing a specimen that was 2 by 2 cm2 in size immersed in toluene for 168 h. The weight was checked using the Flory-Rehner equation before and after immersion in toluene to calculate the crosslinking (Wolff 1996). The dispersion of filler in the NR vulcanizates was observed by scanning electron microscopy at 10 kV and 15 A. The color index of the NR vulcanizates was determined following the ASTM D1746-09 (2009) standard test method and using a UV-Vis-NIR recording spectrophotometer (Model UV-3100, Shimadzu). The results of the physical and morphological characterizations for the untreated and treated BA are given in Table 2. The XRF and FTIR results indicated that silicon dioxide was the main component of the BA, and the remainder of the BA consisted of various kinds of metal oxides. 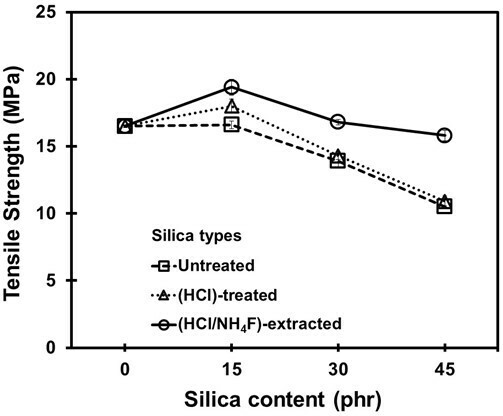 The silica content remarkably increased after the HCl and HCl/NH4F treatments (Ma et al. 2012). The silica content was 77.2% for the untreated BA, 90.6% for the HCl-treated BA, and 97.0% for the HCl/NH4F-extracted samples. This was because HCl was capable of removing metal oxides (Worathanakul et al. 2009; Rahman et al. 2015), while NH4F dissolved the silica in BA to form fluorosilicate ([NH4]2·SiF6) complex compounds, which were precipitated by the NH4OH solution to finally give purified silica (Chakraverty et al. 1988; Ma et al. 2012). The majority of the BA particles had an average particle size of less than 40 µm, and the percentage of small particles increased after the HCl and HCl/NH4F treatments. The surface areas of the BA particles, as well as the pore volume and pore size, were also found to increase after the HCl and HCl/NH4F treatments. This was because HCl and HCl/NH4F had the ability to extract metal oxides in the BA, which made the fibers more spongy and porous, and increased the surface areas (Stuart 2004). There were differences in the morphological and physical characteristics of the BA after going through the different treatment processes, as revealed by the SEM micrographs. The silica from the HCl/NH4F extraction and reprecipitation was in the form of a white powder, while the other two silica fillers exhibited a dark gray color. In addition, the BA fillers after the HCl and HCl/NH4F extractions formed island groups (aggregates) of small silica particles because of the high surface areas and rich functional groups compared to the untreated BA filler. Because the BA had an extremely high content of purified silica, it is likely that the BA could successfully be used as potential filler for reinforcing rubber compounds (Erickson et al. 1992; Kaewsakul 2013; Thomas et al. 2014). The results in Fig. 2 show the cure properties of the NR vulcanizates with silica loadings of 0 to 45 phr. In all cases, it was found that the silica content had no effect on the scorch time. However, the cure time of the NR vulcanizates containing untreated and HCl-treated silica appeared to decrease with increased silica content, which suggested there was faster curing. This was judged to be because the BA contained metal oxides, and these could act as co-activators to reduce the cure time (Sombatsompop et al. 2004). In the case of the HCl/NH4F-extracted silica, where the silica purity was relatively high, the metal oxides left in the vulcanizing system were very low. Therefore, this led to a longer cure time to complete the desirable vulcanization reaction (Omnès et al. 2008; Ooi et al. 2013a). The vulcanizing mechanism was also monitored through the torque difference and crosslink density of the NR vulcanizates, as shown in Figs. 3 and 4. It can be seen that for all cases the torque difference and crosslink density increased along with the silica content. 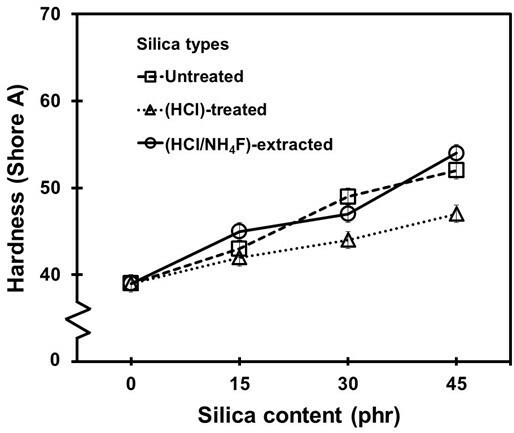 For the given silica contents, the torque difference and crosslink density of the vulcanizates with the untreated silica were the highest and those of the HCl/NH4F-extracted silica were the lowest. The lower torque difference and crosslink density suggested there were more difficulties in crosslinking for the vulcanizing reactions. This could be explained by the fact that the silica purity in the HCl-treated and HCl/NH4F-extracted silica/NR vulcanizates was high. The silica-NR interactions via silane linkages were expected to be high and effective, overtaking the rubber crosslinking by sulfur. This may have prevented the crosslinking reaction by sulfur in the NR compounds (Ooi et al. 2013b; Tangudom et al. 2014; Thongsang et al. 2012). As a result, the torque difference and crosslink density were lower. This proposed mechanism is illustrated in Scheme 1, which models silica-silane-NR interactions for (a) untreated, (b) HCl-treated, and (c) HCl/NH4F-extracted conditions. 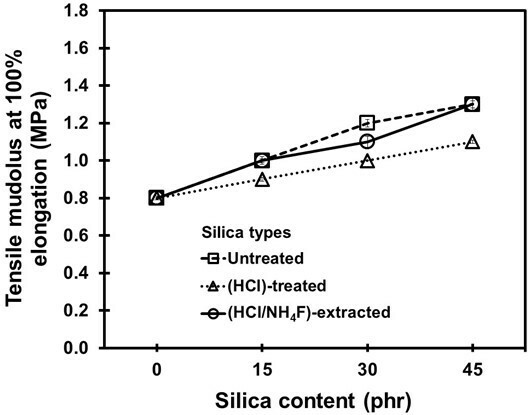 It can be seen that the chemical interactions of the rubber molecules on the treated silica surfaces were greater compared to the untreated silica. 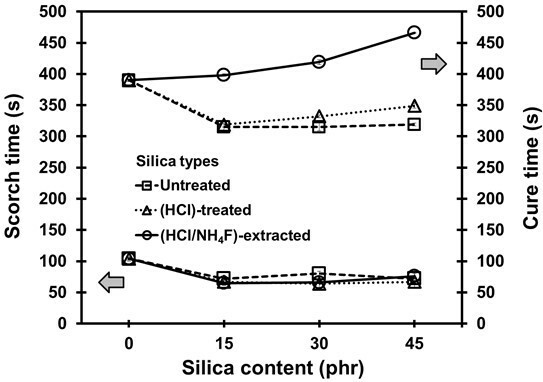 The higher surface areas of the HCl-treated and HCl/NH4F-extracted silica fillers, as quantitatively measured and given in Table 2, probably enhanced such interactions. The mechanism proposed in Scheme 1 was substantiated by the FTIR results given in Fig. 5, which shows the spectra of the NR vulcanizates containing untreated silica (Scheme 1a), HCl-treated silica (Scheme 1b), and HCl/NH4F-extracted silica (Scheme 1c). All of the samples had spectra with stretching vibration of -OH groups in Si–OH on the silica surfaces at wavenumbers 3068.1 cm-1, 3076.9 cm-1, and 3373.8 cm-1 for the untreated silica, HCl-treated silica, and HCl/NH4F-extracted silica, respectively, as shown in Table 2. 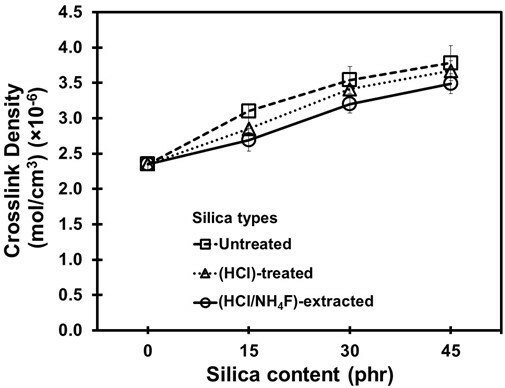 The higher and more pronounced wavenumbers of the treated silica were determined to be denser silanol groups and higher purities of silica filler after the HCl/NH4F extraction. This phenomenon eventually facilitated the chemical interactions between the rubber molecules and the silica via the silane coupling agent. Another possible reason for the higher and more pronounced wavenumbers of the treated silica was that more moisture was absorbed as a result of the denser and higher amount of silanol groups on the silica surfaces. This claim was supported by considering the spectra of the siloxane groups, where it was seen that there were Si-O-Si stretching vibrations at 1031.22, 1052.14, and 1074.96 cm-1, and Si-O-Si stretching/bending at 779.49, 793.75, and 797.00 cm-1 for the untreated silica, HCl-treated silica, and HCl/NH4F-extracted silica, respectively. 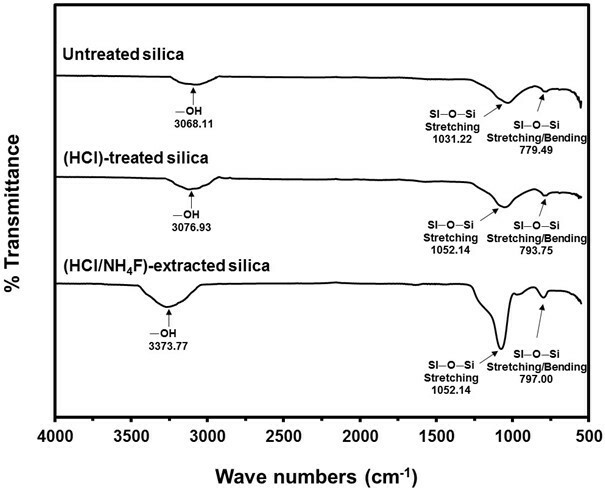 The Si–O–Si stretching/ bending became more pronounced after the HCl treatment and HCl/NH4F extraction, which implied there was the increased possibility of chemical interactions of NR-silane-silica, as given in Scheme 1. Based on the results shown in Figs. 2 to 4, it was concluded that the cure characteristics of the NR vulcanizates in this work were dependent on the purity and content of silica, i.e. the higher the purity, then the longer the cure time and the lower the amount of crosslinking that will take place. Figures 6 and 7 show the Shore A hardness and tensile modulus at 100% elongation of the NR vulcanizates. It was found that the surface hardness and tensile modulus increased when the silica content increased. This was due to the naturally high rigidity of the silica (Tangudom et al. 2014). The effect of the purification process on the hardness and tensile modulus was small. Figure 8 shows the results of the tensile strength for the NR vulcanizates containing the three different types of silica. The tensile strength increased at a silica content of 15 phr, and then it progressively declined at higher silica loadings. The increase in tensile strength at a silica loading of 15 phr suggested there was a higher reinforcing level due to the well-dispersed silica in the NR matrix, which resulted in a high silica–NR interaction (as explained in Scheme 1). The decreases in tensile strength at higher dosages of silica was generally expected because of the poor silica dispersion in the NR matrix, which resulted in silica aggregation and led to high filler-filler interactions (Agarwal et al. 2005). The dispersion of the silica particles in the NR at 15 phr (Fig. 9b) and 45 phr (Fig. 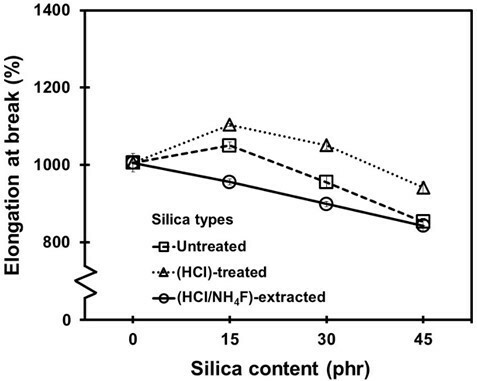 9c and 9d), as shown by the SEM results, clearly indicated that with a high content of silica (45 phr), even when treated with HCl and HCl/NH4F, large aggregations of silica were observed, and the silica–NR interactions would therefore be less. If this was the case, the molecular interactions between silica and NR via silane in Scheme 1 (15 phr silica content) would be changed to those displayed in Scheme 2 (45 phr silica content). Based on the results shown in Figs. 3, 4, 9, and Scheme 1, it is very important to note that, at a proper loading of silica, the purifying process of HCl and HCl/NH4F may have prevented rubber–rubber crosslinking, but it also helped to minimize the occurrence of filler–filler interaction, which is the main factor that worsens the properties of silica-filled NR vulcanizates (Affandi et al. 2009). For any given silica loading, the tensile strength of the HCl/NH4F-extracted silica-filled vulcanizate was the highest and the untreated silica-filled vulcanizate had the lowest value. 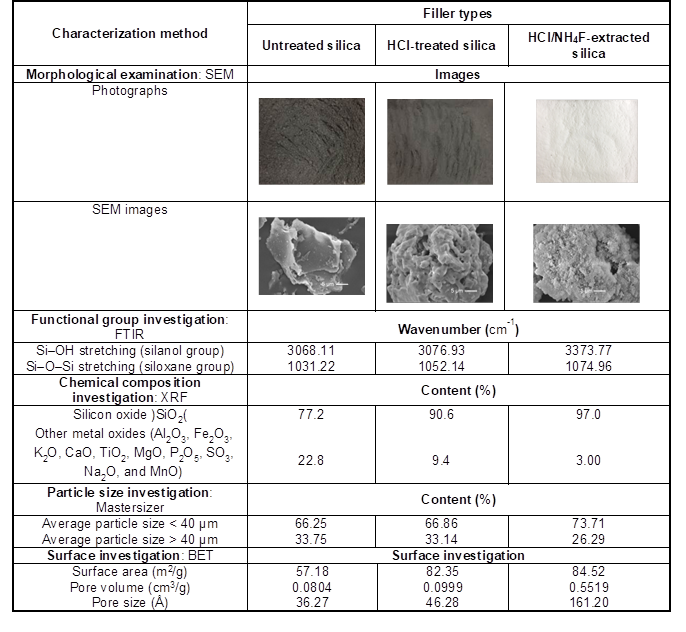 This was ascribed to the purity levels and morphologies of the silica after HCl and HCl/NH4F treatments, as shown in detail in Table 2. Figure 10 shows the elongation at break results for the NR vulcanizates as a function of the silica loading and purifying process. It was found that the elongation at break tended to decline with increased silica content, although there were small peaks for the 15 phr untreated and HCl-treated silica-filled vulcanizates. The decreases in elongatability were to be expected because the presence of the rigid fillers restricted the molecular movements of the rubber (Ismail et al. 1999; Arayapranee et al. 2005). In addition, the higher the silica content was, then the greater the filler-filler interactions. Although the elongation of the NR composites dropped as a result of the increased silica content, the overall elongation of the filled vulcanizates for all of the silica conditions ranged from 900% to 1,100%, which is still considered sufficiently high for general applications (Kanking et al. 2012). Figure 11 shows the compression set of the NR vulcanizates as a function of the silica content. It was found that the silica content had a marginal effect on the compression set. The value slightly increased as the silica content increased, especially for the untreated and HCl-treated silica fillers. The increase in the compression set is usually referred to as lowered elasticity of the vulcanizates, which corresponded to the results shown in Fig. 10. Surprisingly, the compression set of the vulcanizates containing HCl/NH4F-extracted silica appeared to decline at 15 and 30 phr before increasing at 45 phr. The decreases in the compression set, which reflected the silica reinforcement in the NR vulcanizates at the 15 and 30 phr silica loadings, supported the tensile strength results shown in Fig. 8. Other results that supported the improved compression set for the HCl/NH4F-extracted filled NR vulcanizates included the smaller particle size, higher specific surface area, greater porosity, and larger pore volume of the HCl/NH4F-extracted silica. Another reason for the worsening of the compression set in the untreated and HCl-treated vulcanizates was the actual volume of the silica. Because the purities of the silica in the three conditions were different, the vulcanizates with low-purified silica, i.e., the untreated BA with a silica content of 77.2%, required more filler to compensate for the silica loading. In non-black rubber products, the brightness or lightness of the NR vulcanizates is usually determined before and after filler addition. 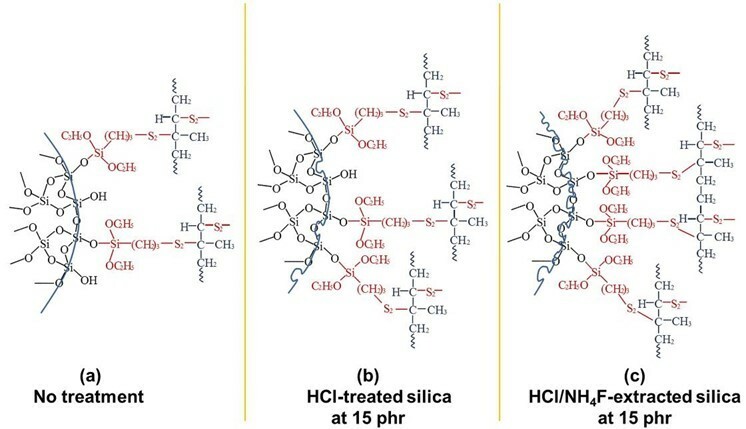 In this work, the lightness (L*) results for the NR vulcanizates containing untreated, HCl-treated, and HCl/NH4F-extracted silica fillers are given in Fig. 12. 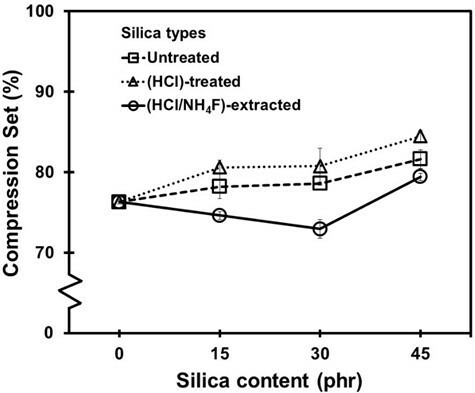 It was found that addition of the HCl/NH4F-extracted silica to the NR vulcanizates had no effect on L*, while the untreated and HCl-treated silica decreased the L* values. This involved the initial color and morphologies and percentage purity of the silica fillers from the different treatments, as shown in Table 2. The BA with a silica content of 77.2% was treated by HCl or HCl/NH4F to purify the silica before its use in reinforcing the NR vulcanizates. After purifying, the silica content was 90.6% for the HCl treatment and 97.0% for the HCl/NH4F extraction. HCl and HCl/NH4F also had the ability to extract metal oxides in the BA, which gave the purified silica a more spongey and porous texture and higher surface areas. The higher the purity of the silica was, then the longer the cure time and the lower the rubber crosslinking. The tensile strength and compression set were found to improve at a silica content of 15 phr. The purifying processes of HCl and HCl/NH4F may have prevented rubber-rubber crosslinking, but it was found to help in minimizing the filler-filler interaction. The elongation range for the NR vulcanizates with BA silica in this work was 900% to 1,100%. 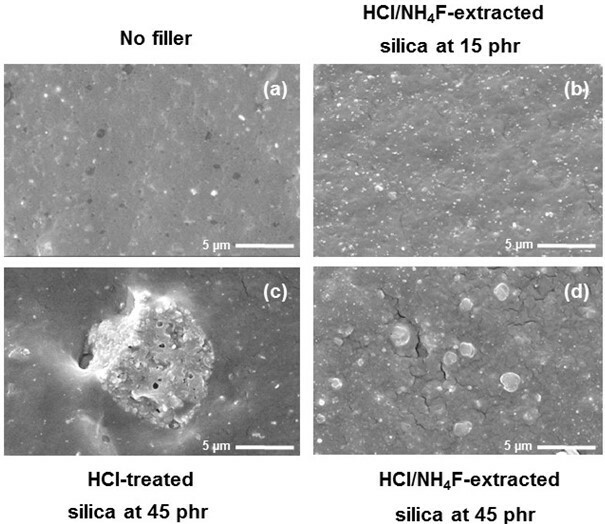 The use of HCl/NH4F-extracted silica in the NR vulcanizates had no effect on the L*, while the untreated and HCl-treated silica demonstrated decreased L*. 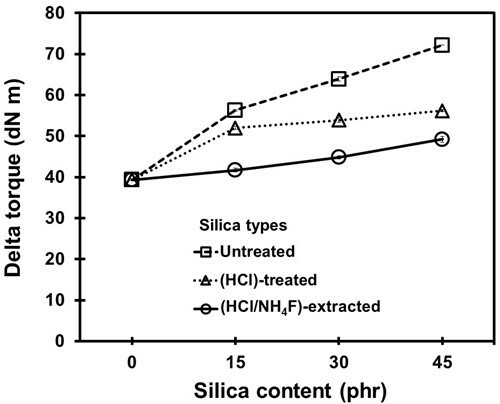 Based on the results of this work, silica from BA is recommended to be treated with HCl followed by NH4F extraction before use, and the optimal loading of the HCl/NH4F treated silica was 15 phr. The authors are grateful to the Thailand Research Fund and the Office of the Higher Education Commission (OHEC) under the National Research University (NRU) Program for the financial support, and to Mitr Phol Sugar Corp., Ltd. (Thailand) and Behn Meyer Chemicals Co., Ltd. (Thailand) for supplying the bagasse ash and chemicals. ASTM D1746-09 (2009). “Standard test method for transparency of plastic sheeting,” ASTM International, West Conshohocken, PA.
ASTM D2084-11 (2012). “Standard test method for rubber property-vulcanization using oscillating disk cure meter,” ASTM International, West Conshohocken, PA.
ASTM D2240-05 (2005). “Standard test method for rubber property-durometer hardness,” ASTM International, West Conshohocken, PA.
ASTM D395-03 (2003). “Standard test methods for rubber property-compression set,” ASTM International, West Conshohocken, PA.
ASTM D412-15a (2016). “Standard test methods for vulcanized rubber and thermoplastic elastomers-tension,” ASTM International, West Conshohocken, PA.
Kaewsakul, P. (2013). 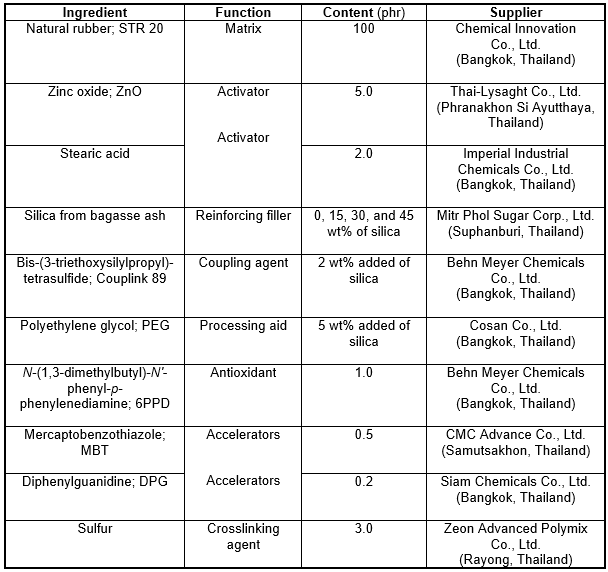 Silica-Reinforced Natural Rubber for Low Rolling Resistance, Energy-Saving Tires: Aspects of Mixing, Formulation and Compatibilization, Ph.D. Thesis, University of Twente, Enschede, the Netherlands, and Prince of Songkla University, Pattani Campus, Thailand. Kharade, A. S., Suryavanshi, V. V., Gujar, B. S., and Deshmukh, R. R. (2014). “Waste product ‘bagasse fiber ash’ from sugar industry can be used as stabilizing material for expansive soils,” IJERT 3(3), 506-512. Kohjiya, S., and Ikeda, Y. (2014). Chemistry, Manufacture and Applications of Natural Rubber, Woodhead Publishing Ltd., Cambridge, UK. Phrommedetch, S., and Pattamaprom, C. (2010). “Compatibility improvement of rice husk and bagasse fiber ashes with natural rubber by molten-state maleation,” Eur. J. Sci. Res. 43(3), 411-416. Stuart, B. H. (2004). Infrared Spectroscopy: Fundamentals and Applications, John Wiley & Sons Ltd., Chichester, UK. Thomas, S., Chan, C. H., Pothen, L. A., Joy, J., and Maria, H. (2014). Natural Rubber Materials: Volume 2: Composites and Nanocomposites, The Royal Society of Chemistry, Cambridge, UK. Worathanakul, P., Payubnop, W., and Muangpet, A. (2009). “Characterization for post-treatment effect of bagasse ash for silica extraction,” World Acad. Sci. Eng. Technol. 56(32), 360-362. Article submitted: September 15, 2016; Peer review completed: December 12, 2016; Revised version received: December 19, 2016; Accepted: December 27, 2016; Published: January 4, 2017.